Author Maura SmalePosted on February 16, 2015 Categories Just ThinkingTags blogging, comments, social media4 Comments on Don’t Write the Comments? ACRLog welcomes a guest post from Sarah Crissinger, graduate student in library and information science at the University of Illinois at Urbana-Champaign. In October 2013, Steven Salaita accepted a tenure-track position within the American Indian Studies program at the University of Illinois at Urbana-Champaign. He subsequently quit his job and made arrangements to uproot his family from their home in Virginia. On August 1, 2014, Chancellor Phyllis Wise revoked his offer—an offer which had been decided upon by faculty within the American Indian Studies program—stating that she would not be passing along his recommendation to the Board of Trustees. Wise cited Dr. Salaita’s tweets as the impetus for utilizing this loophole, stating that “personal and disrespectful words or actions that demean and abuse either viewpoints themselves or those who express them” would not be tolerated. Later, it was revealed that Wise was in close contact with donors that had differing views from Dr. Salatia’s. These actions have created a “catastrophe” for the University of Illinois at Urbana-Champaign for several reasons. 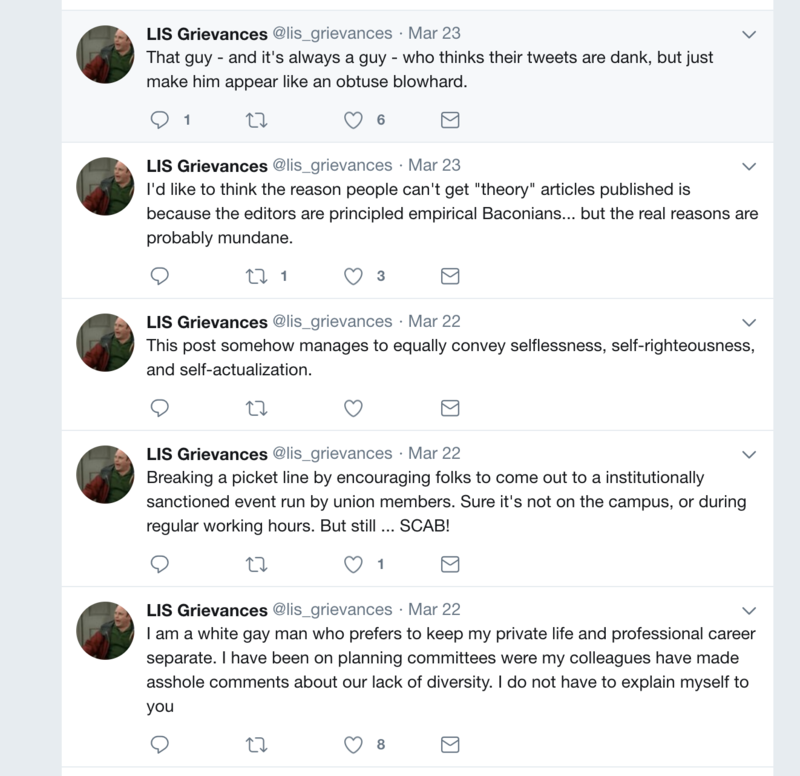 First, Wise made a conscious decision not to engage in a discourse about Dr. Salaita’s viewpoint or even the format he chose to express it in, but instead punished him for voicing his opinion by compromising his livelihood. These actions don’t seem to be in-step with the values of the academy. UIUC also exhibited no real due process. The American Association of University Professors (AAUP) has held that Illinois failed to demonstrate cause without holding any hearings or even providing proper notification. Most importantly, UIUC’s actions are an egregious violation of academic freedom. But I will assume that I don’t have to tell LIS professionals (who are embedded in academia!) the reasons why. LIS scholars, practitioners, and students have already recognized this violation of intellectual freedom and have agreed to boycott Illinois. In addition, ACRL’s Women and Gender Studies Section has facilitated a discussion about the events on UIUC’s campus. I want to instead challenge librarians to think about Dr. Salaita’s unique case in a new way. We have reached a pivotal moment in the academy. “Scholarly” communication is being redefined before our very eyes. Next month, I will be involved (at UIUC nonetheless) with an Online Scholarly Presence Symposium, hosted by the library. We will be encouraging students to embrace social media, blogs, repositories, and other public outlets for their scholarship and ideas. I currently teach a workshop about altmetrics for graduate students and faculty at UIUC. It is centered on the idea that scholarly impact isn’t as simple as citation counts; we explore impact by looking at traditional metrics alongside alternative metrics that account for public presence. Twitter has opened up the contours of the academy, widening my communities within it and linking me to the world beyond it. By using Twitter as a professional tool, I have become a person committed to working in public. I have learned more about genre, rhetoric, and audience than I ever did in college or graduate school. Ideas for articles, projects, and books germinated on Twitter. Twitter is proto-scholarship; you won’t find it in my tenure file but it’s responsible for everything in it. Ithaka S+R’s 2012 report entitled Supporting the Changing Research Practices of Historians found that many historians use their blogs to “test the waters” for new scholarship. Sometimes they even present findings because, as one respondent stated, “I have a book. Maybe forty people have cracked the spine. But, the blog has tremendous readership.” However, the report also finds that changes in disciplinary culture and T&P practices are incremental at best. Only by adapting these practices to new modes of communication and embracing junior faculty that implement them will any real change come to fruition. Many people argue that “tweets are not the same as classroom teaching (or scholarly writing),” and, to some extent, I agree. At the same time, we have to acknowledge that in today’s academic environment, the two are inadvertently conflated. A scholar’s online presence—especially when it is related to their academic niche—is undeniably linked to that scholarship, and more broadly the scholar themself. Again, leaders interested in scholarly communication are attempting to change the tenure environment so that digital work and social media presence are measured and a more of a portfolio model is implemented. So the current question is, how can Dr. Salaita’s tweets be used to jeopardize his academic career but cannot be used to reflect his academic impact or scholarly success? I am, of course, illustrating a point that applies more broadly to all scholars. Dr. Salaita’s case has opened a can of worms for academics everywhere. Where is the line between personal and professional, if there is such a thing? What is “fair game” for interpretation or critique? How can we facilitate conversation if we’re fearful of repercussions? My intention is not to suggest a scenario of big-brother institutions that track down scholars. I think that instead we should recognize alternative forms of scholarship so that they are more fully protected. The AAUP’s report on Academic Freedom and Electronic Communications states that electronic communication does not “warrant any relaxation of the rigorous precepts of academic freedom”. It calls for surveillance to end and for faculty to be involved in IT decisions concerning privacy and academic freedom. It asserts that intramural and extramural communication or “speech outside or inside the university’s walls” is irrelevant in the world of electronic communication. The report says that it’s a no-brainer if the social media outlet isn’t linked to the scholar’s academic work; personal tweets, for example about political views, are protected. But what about when politics are central to scholarship? As an aspiring librarian, I find myself standing up for what I believe in (and what my profession believes in) not only in my daily interactions but also in my social media presence. There are a whole host of professionals that would probably agree—political scientists, scholars of medicine, etc., etc. Not everyone will agree with everyone else’s methods, conclusions, values, or even presentation! There is no form of scholarship that is neutral. But that’s the beauty of it, right? The academy allows us to converse with each other (aren’t we saying that scholarship is a conversation these days? ), even if we disagree. In many ways, Dr. Salaita’s case is an abnormal one. But it is also a case that has the ability to set precedence, not only in the discussion of social media and academic freedom but also in the conversation about changing scholarly practices. I once had a panel of deans come into one of my classes and assert that scholarship, as a practice, is less about tenure and the vetting processes attached to it and more about changing the world, advancing knowledge, and making a direct impact on the city, state, or nation it is published in. That’s a lofty assertion but it’s one I’d challenge us as librarians and scholars to think more critically about. Scholarship can be communicated in endless formats, often depending on what is most conducive to the audience and topic. It’s time to protect and acknowledge work that looks different than “traditional” scholarship. If we don’t, we risk losing creative and innovative faculty and an engaging conversation that could change the world we live in. To support Dr. Salaita and the Department of American Indians Studies, please join the students, faculty, and alumni of the Graduate School of Library and Information Science at UIUC in signing this open letter.